When you’re hosting an event you want it to run smoothly. There are a lot of factors that go into making a successful event, and one of the main factors is… the food. People often judge an event based on how much they loved or loathed the food available. Many events are catered, whereas a catering company prepares (and often serves) food (and drinks) to the assembled crowd. Now catering can be done “on-site” or “off-site.” That means the workers can either make the food at the venue (on-site), or make it beforehand and bring it there (off-site). 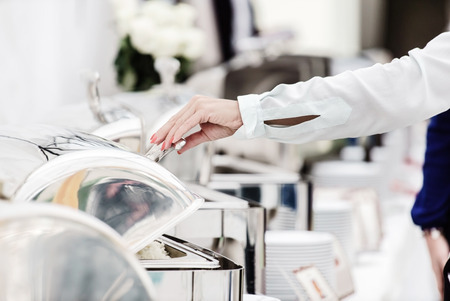 What are some benefits of off-site catering services? First, off-site catering can be cost effective if you’re watching your pennies. Instead of having to have a venue that allows for the preparation of meals, you can get away with renting a cheaper place that doesn’t have as many amenities. Therefore, you’re not having to pay for a lot of “extras” certain places might have, such as stoves, fridges, dishwashers, etc. Furthermore, off-site catering puts more power in your hands to decide what’s what at your event. Rather than be dictated to, you get to decide quite a bit of logistics, such as the number of food stations, number of chairs/tables to use, how the food will be served, etc. So, if you like to save money and have more power in the decision-making process of how the event will ultimately be presented, off-site catering makes sense. Next, group size is a factor. With off-site catering, you don’t have limits on the group size. Why? With on-site catering, the people making the food are limited to the space they’ve got to work with as well as time restraints. They’re at the mercy of the venue and its facilities, whereas off-site catering gets the work done elsewhere, and can typically handle making more food for larger groups. R&R Caterers, for instance, can handle food for 600 guests. Finally, off-site catering opens up the potential for more interesting parties with unusual themes. Because the food is prepared ahead of time and “brought in,” the food can be brought to picnic shelters in parks, a boat marina, or elsewhere. In this way, off-site catering allows for versatility, which is a good thing especially if you plan to have your event in a somewhat unconventional place/space. R&R Caterers of Bensalem, PA, does off-site catering; to find out more information about how it all works to satisfy your needs, please call 215-638-7376.